Fort Fraser, Florida was a U.S. Army post was established by Lieutenant Colonel William S. Foster and the 4th U.S. Infantry in 1837 during the Second Seminole War. 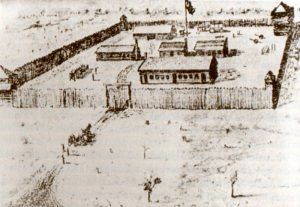 The fort was constructed at the former site of Seminole Chief Oponey’s plantation by Lake Hancock. The fort was named for Captain Upton S. Fraser, who was killed in the Dade Massacre in December 1835. The post was built in preparation of General Zachary Taylor march against the Seminole Indians and Colonel Foster ordered the construction of a bridge and causeway ahead of the fort in mid-November 1837. When General Taylor came through, he deposited supplies before continuing towards the Kissimmee River. Taylor’s march culminated in the Battle of Okeechobee on December 25, 1837. The fort was abandoned by the Army in May 1838, only to be informally used later as a shelter during the Third Seminole War and again in the Civil War. It was located at present-day Highland City, Florida. 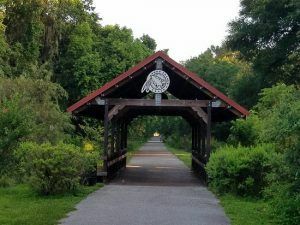 Today, the site of Fort Fraser is located along the Fort Fraser Trail, 7.75 miles path that runs from Bartow to Lakeland along the old route of the Atlantic Coast Line Railroad. It is also part of the Seminole Wars Heritage Trail.